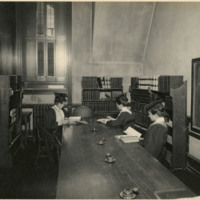 Interior view of the math library in Taylor Hall. 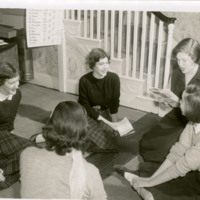 Three students sit around a table reading. They are dressed in academic robes. There are several shelves filled with books in the room. The photograph was a part of the Louisiana Purchase Exposition of 1904. 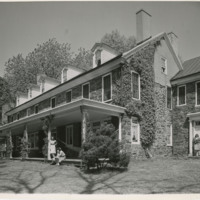 Exterior view of the back of Wyndham Hall. Three students outside Wyndham Hall. 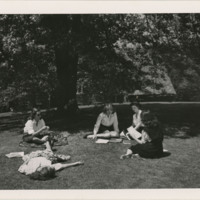 On the far right side of the image, one student is leading against the back door reading a book. Three other students are on the back porch. Two of them are sitting down and one is standing, leaning against a pillar. 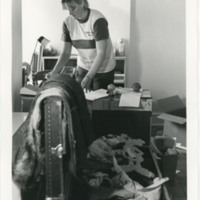 Interior view of the French House, Wyndham Hall. 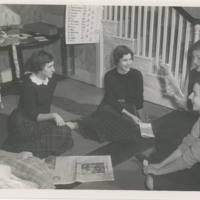 Five students sit by the staircase . 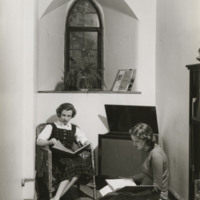 One student, sitting close to the staircase, reads from a magazine. A copy of The New York Times lies on the ground in the middle of all the students. 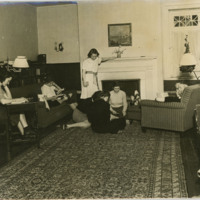 Interior view of the French House, Wyndham Hall. 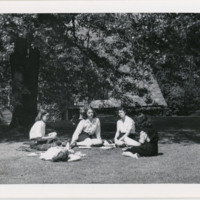 Five students sit in a circle by the staircase. 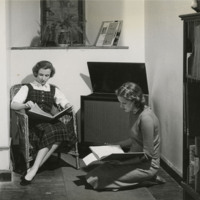 One student, sitting closest to the staircase, reads from a magazine to the others. The rest of the students direct their attention towards the student who is reading.